This week I was listening to a ‘Good Food’ radio program out of Los Angeles with host Evan Kleiman. The first interview of the day was with Deuki Hong and Matt Rodbard, authors of “Koreatown: A Cookbook,” created by two longtime close friends traveling and eating their way around Koreatowns throughout the country, returning then back to New York, recreating recipes from the home kitchen. 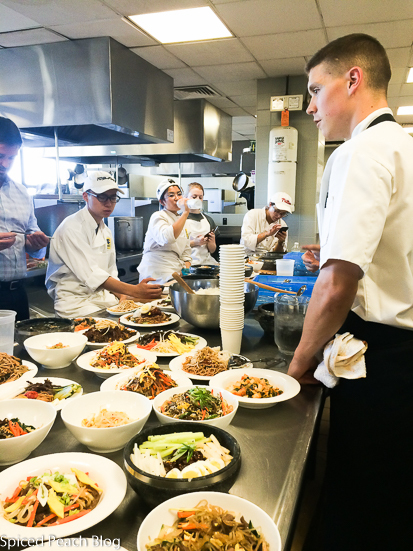 At one point in the interview Kleiman commented an important component in learning, and really understanding, the depth of any cultural food is to cook it, deconstruct it, rather, to understand the ingredients, and how they work together in the creation of dishes. I thought the point was brilliant and true, ironically so for me and my own relationship with Korean food, including the further depth of learning gained through the Korean Cuisine Class I took at Drexel University last semester. You likely already know that both are my daughters are from Korea, and so my journey with this cuisine began now twenty-seven years ago, and, as I shared in a presentation at the Thomson Reuters Asian American Pacific Program in New York last year, was also tasked with the introduction of very new ingredients and how to introduce them to family members and friends. You might imagine I got a big laugh from the group saying that the first “exotic” ingredient challenge was soy sauce. True. Also, in those days I had to go to the Korean market for soy sauce, and, purchase one giant bottle, which also got a giggle from the group admitting wondering to myself how in the world I was ever going to use it all up! By now I’ve used up countless large bottles of soy sauce, not to mention that soy sauce has become a condiment now in most every refrigerator throughout the country, even if one doesn’t cook Korean foods. Week 5 of Korean Cuisine class was meat, including today’s Spicy Korean Pork, Jeyuk-gui, it’s preparation among the range of choices, along with uses and historical perspective from ancient times to today. The thing is, after these months of reflection, one of the most important benefits of the Korean Cuisine class for me was in providing that deeper understanding, or, similar as Evan Kleiman aptly expressed in her radio interview, the enabled opportunity to deconstruct multiple ingredients and delve a bit more into these principle components, how they work together. For really, before that, despite having eaten Korean food at restaurants and homes of friends over these many years, even preparing a broad range of dishes, something always seemed to be missing within me, something that the process of deconstructing, observing, tasting, sharing, each individual dish, and then collectively, was the unique insight the weekly categories provided. 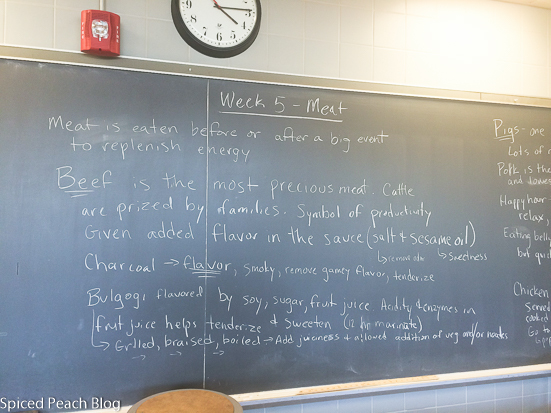 The class also helped me get a bit better in my pronunciations and use of the actual Korean names for ingredients, such as Gochujang. Gochujang. Don’t you just love that word? Really. It is so much fun. 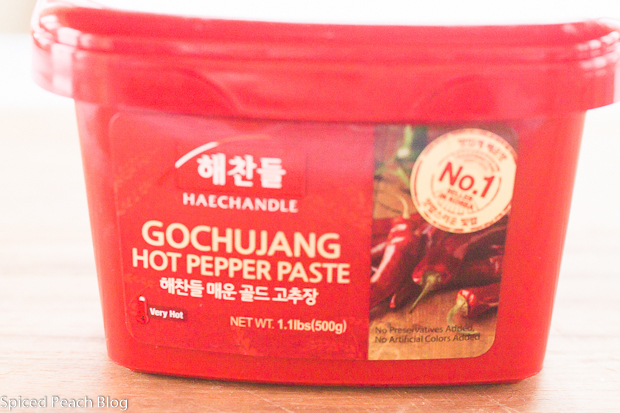 My gandson and I now have a lot of Gochujang passing going on these days. 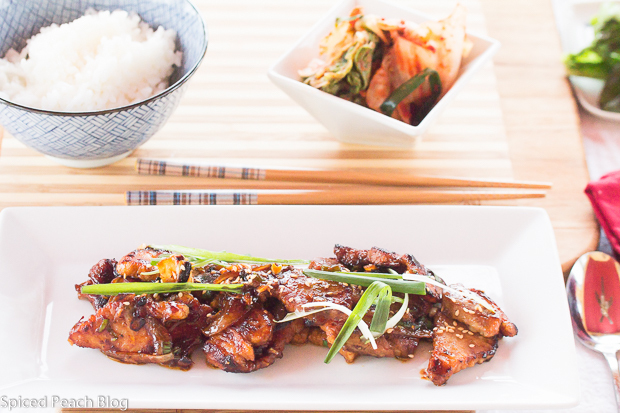 I chose Spicy Korean Pork, Jeyuk-gui as my next Korean dish to share with you from the Korean Cuisine class at Drexel last fall, mainly besides being incredibly tasty, it is quite simple for you to prepare while bringing together some of those more commonly used ingredients. The Korean history with pork being not too dissimilar from some other cultures with Pork providing as the more common meat among the common man, more affordable. 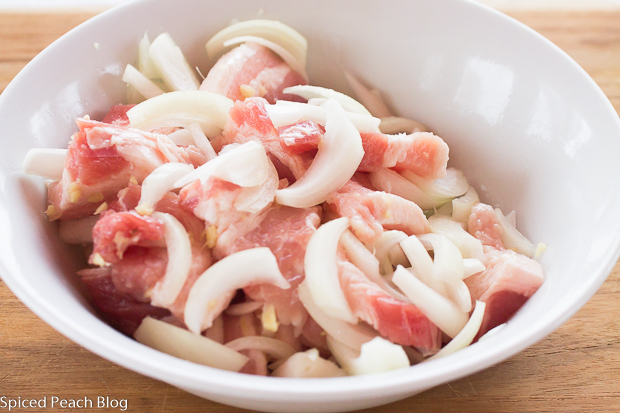 Although the Pork Belly used in this preparation appears like thickly sliced bacon, its flavor, once sauteed with the onion more so resembles the flavor of Pork Roast with a lovely spicy kick. Gochujang in Jeyuk-gui. Some lettuce leaves, some rice, a few little Banchan, you’ll love it! All ingredients may be found at Korean or International Markets. 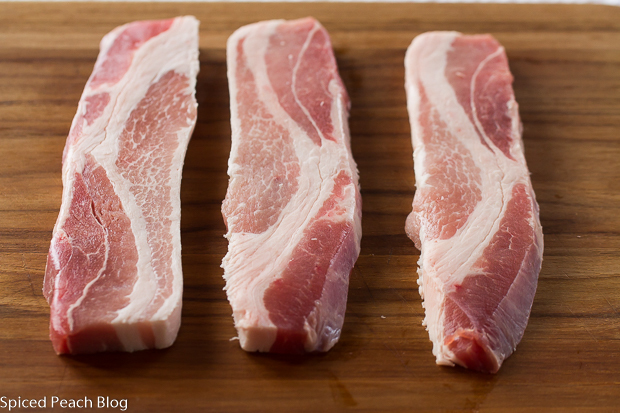 Pork Bellies are located with the pork in the meat section of the markets, resembling a thick cut of bacon though they cook similar in flavor to a pork roast slice. Into a bowl blend together the scallions, garlic, soy sauce, sugar, red pepper paste, Mirin, black pepper, and sesame oil, set aside. Add oil to a skillet on medium low heat and once hot add in the pork belly and onions. Saute pork until just done then pour in the sauce mix, stirring well and heating through until hot. 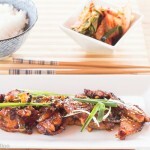 Plate cooked pork sprinkling with sesame seeds and garlic for garnish. Serve alongside lettuce pieces and rice, and if available, a few Banshan. This entry was posted in Artisans- Farms -Markets-Chefs- Journeys, Foods Around the World, Meats and tagged Jeyuk-gui, Korean Cuisine Journey at Drexel University, Korean Pork, Korean Pork Jeyuk-gui Korean Cuisine Journey at Drexel University, Spicy Korean Pork, Spicy Korean Pork Jeyuk-gui. Bookmark the permalink. Post a comment or leave a trackback: Trackback URL. I don’t think I’ve ever had pork bellies. Does it taste like bacon? They look delicious! Hi Kelly, no it does not taste like bacon, it tastes more similar to a spicy slice of pork roast, it is also quite delicious grilled! Hi Peggy, I have the Koreatown cookbook and it is wonderful. How cool that you took a Korean cooking class. My husband would go crazy for this. Take care! Hi Cheri, thank much. Can’t wait to get the cookbook! And I loved my Korean Cooking Class!